Come on down to the Trolley Car Portal at 4oth & Baltimore Avenue and get Happy at the Trolley Car Station. 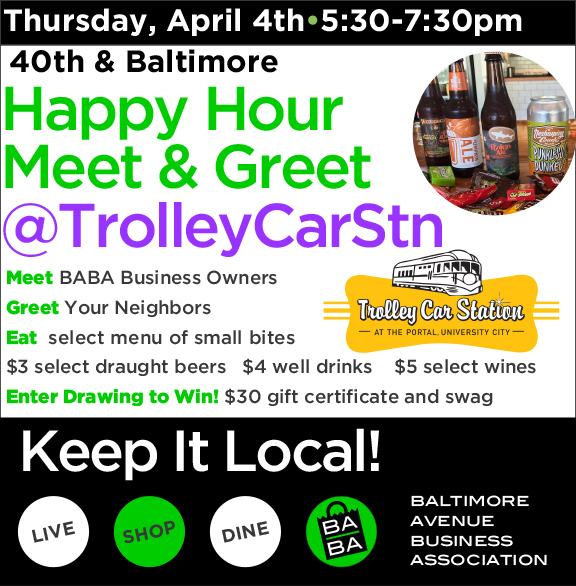 Enjoy Small Bites and Select Beers, then enter a drawing for a $30 Trolley Car gift certificate, and Trolley Car Swag! Meet Baltimore Avenue Business Owners and get to know the staff at the Trolley Car Station. Try some chicken or seitan wings. Beer, Pizza, Chicken on a Stick, Ice Cream Bars, Puppy kisses, you name it, and it’s for sale for $1 on Baltimore Avenue. Business owners set up on the sidewalk to sell you samples of their wares. The sidewalks are full of happy strollers enjoying live music and goodies. Come stroll the Avenue, check out the wares, and enjoy the vibe! Enjoy a stroll on Baltimore Avenue! The Baltimore Avenue Business Association, (BABA), represents the businesses along the vibrant Baltimore Avenue corridor in University City, West Philadelphia. All of the businesses are easily reached by taking the Green Line 34 Trolley or by following the bike paths. You can, of course, walk or drive. This business corridor serves the diverse West Philly community which cuts across several neighborhood associations: Cedar Park, Garden Court and Spruce Hill. The heart of the community, of course, is beloved Clark Park where everyone can be seen at one time or another. Young or old, families, students, business people, anarchists, artists, musicians and their 4-legged friends all relax and play at the park. 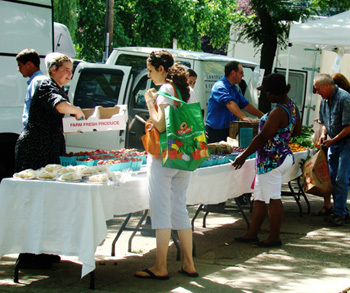 And twice a week, the Clark Park Farmers Market is jammed with people buying fresh farm produce.